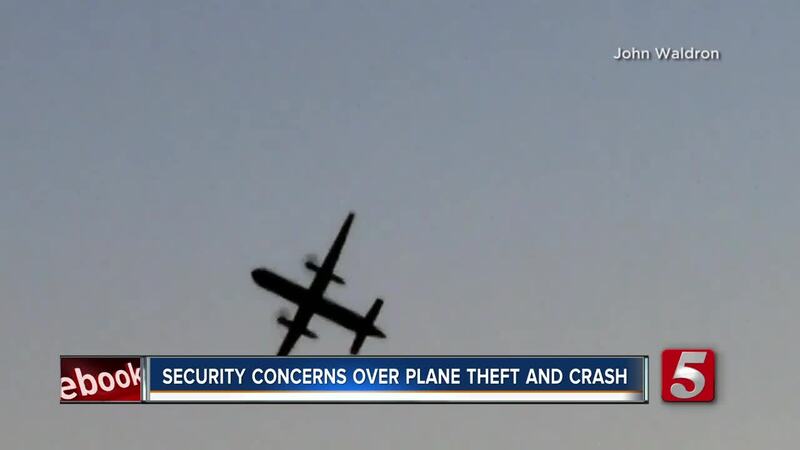 Just days after an airport employee stole and crashed a commercial airplane near Seattle, the big question is, "could it happen again?" Homeland Security is evaluating this new potential threat, and it's a concern for airports across the country including right here in Nashville. Plenty is done to protect the passengers in an airport, but the question being asked now after what happened in Seattle is what's being done to protect the planes? "I think if bad people want to do something they are going to find a way to do it," said Jason Morgan. He pilots NewsChannel 5's Sky 5 and has logged more than 5,000 in all types of aircraft. Morgan was shocked to learn a ground crew worker managed to steal a commercial airliner Friday from the Seattle-Tacoma Airport, later crashing it in a remote island. "It's extremely rare, but brings to light something that needs attention," said Morgan. But, how to stop someone like 29-year-old Richard Russell? He was in uniform, had credentials and was cleared to be in secure aircraft areas. Russell could easily gain access to the cockpit and there's typically no key needed to start the engines. He told air traffic control he learned to fly from video games, but there's also a how-to chart right there at the flight controls. "If you can read a checklist you can start these engines," said Morgan. So, what options will Homeland Security recommend? Commercial planes could be required to install security codes or key pads only for pilots, but as great cost. Or there could be locks placed on the outside of cockpit doors. "The problem with that is maintenance personel need access to those systems up front," said Morgan. The simple truth is that preventing access for someone already clear to be working near the planes is no easy task. So, when will we know if there are any changes to security? Officials at the Nashville airport said they will be involved in a conference call with those at the Seattle-Tacoma Airport t review what can be done better. All airport and airline employees with security access are given background checks. Experts say the best deterrent may be others reporting any unusual behavior on behalf of a co-worker. As far as we know there were no warning signs involving Richard Russell in Seattle.